This page is dedicated to show some exerpts, abstracts and references of scientific articles around experiments explaining the effects and results of the principels of the influence of electricity and magnetism on plant growth, development, seed germination and water energetics for plants. What Lakhovsky discovered was simply mind boggling : He postulated that all living cells (plants, people, bacteria, parasites, etc.) possess attributes which normally are associated with electronic circuits. These cellular attributes include resistance, capacitance, and inductance. These 3 electrical properties, when properly configured, will cause the recurrent generation or oscillation of high frequency sine waves when sustained by a small, steady supply of outside energy of the right frequency. This effect is known as resonance. It's easiest to compare it with a child swinging on a playground swing. As long as the parent pushes the swing a little at the right moment (the correct 'frequency'), the child will continue to swing high and continuously. In electronics, circuits which generate these recurrent sine waves can be called electromagnetic resonators, but more commonly they are referred to as oscillators. Lakhovsky tells us that not only do all living cells produce and radiate oscillations of very high frequencies, but they also receive and respond to oscillations imposed upon them from outside sources. This outside source of radiation or oscillations are due to cosmic rays which bombard the earth continuously. This stupendous realization, achieved during the golden years of radio, not only led to a new method of healing by the application of high frequency waves, but broadened appreciation for the newly emerging field of hidden science known as Radionics or Radiathesia. He initially proved his theory using plants. 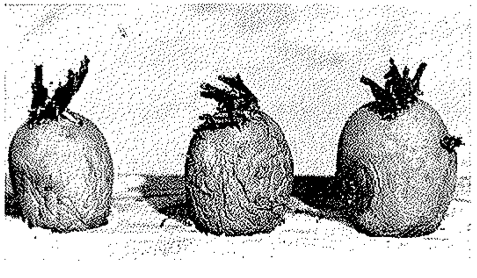 In December, 1924, he inoculated 10 germanium plants with a plant cancer that produced tumors. After 30 days, tumors had developed in all of the plants. He took one of the 10 infected plants and simply fashioned a heavy copper wire in a one loop, open-ended coil about 30 cm (12") in diameter around the center of the plant. and held it in place with an ebonite stake . The copper coil acted as an antennae or a tuning coil, collecting and concentrating oscillation energy from extremely high frequency cosmic rays. The diameter of the cooper loop determined which range of frequencies would be captured. He found that the 30 cm loop captured frequencies that fell within the resonant frequency range of the plant's cells. This captured energy reinforced the resonant oscillations naturally produced by the nucleus of the germanium's cells. This allowed the plant to overwhelm the oscillations of the cancer cells and destroy the cancer. The tumors fell off in less than 3 weeks and by 2 months, the plant was thriving. All of the other cancer-inoculated plants-without the antennae coil- died within 30 days. 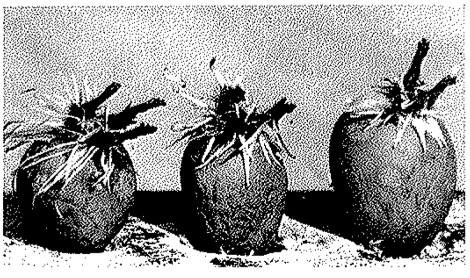 In his book, Lakhovsky shows pictures of the recovered plant after 2 months, 6 months, and 1 year. Three years later, with the original coil left in place, the plant grew into a very robust specimen. Taking his cue from the germanium experiments, Lakhovsky then fashioned loops of copper wire that could be worn around the waist, neck, elbows, wrists, knees, or ankles of people (or animals) and found that (given enough time) much relief of painful symptoms were obtained. These simple coils, worn continuously around certain parts of the body, would invigorate the the strength of the human cells and increased the immune response which in turn took care of the offending pathogens. At the time, when news spread of the success achieved with these "Lakhovsky Coils", many Europeans were clamoring to get their own and often had to wait for months due to the backlog (If you're interested, you can make your own Lakhovsky Coils or obtain them ready made from Educate-Yourself ). One of the main reasons why so many people find copper wrist bracelets effective and beneficial is because the bracelet is functioning as a Lakhovsky Coil (it's also providing minute trace amounts of copper to the body, which helps too). To achieve the Lakhovsky effect, it's important that the coil (or bracelet) is "open" and made of copper. Closed rings simply don't work. 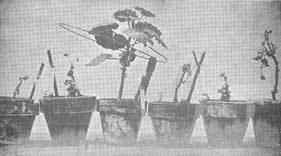 Photos : left, different pots planted with germanium plants, there were all inoculated with cancer, the only one that survive and heals is the one with the Lakhovsky antenna. Right photo : similar plant several weeks later, grows big and healthy. Marcel Violet was a french engeneer, researcher and inventor. He did many inventions known in Mecanics and Medecine but he did also experiments with on plant growth and health before experimenting in medecine. 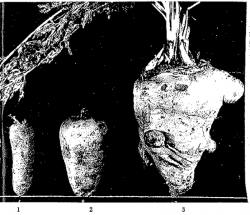 Photo : Carrots, left : 2 carrots untreated, right : carrot where the seeds were soaked 8 hours with treated water with the bio-oscillator before being planted. His theory that he succeeded to prouve was that he could treat the water in a certain way, that the water became load with special healing and stimulation properties for health and also plant growth. he developed a system named as the biooscillator of marcel Violet. This oscilator sended electrical discharges of a capacitor made of bee wax as dielectric. Bee wax is a special dieelectric that produces the grass effect on an oscilooscope. This is because of the presence of very high frequencies. he postulated these frequencies were like cosmic frequencies of very high frequency. The treated water had the property to stimulate healing and increase growth rate of plants. He did also experiments on animals with the same results, increased growth rate and much better resistance against bacteria, viruses and parasites. In his water treatment device, the bio -oscilator, the bee wax plays a central role. He was convinced the bee wax holds in its structure and characteristics special capabilities to generate certain very high frequencies with healing characteristics for plants and animals. 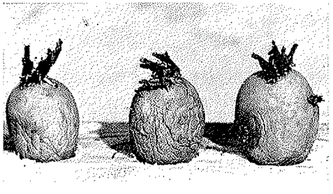 Photo below : left : untreated potatoes ; right : potatoes that has been sprayed with treated water. Experiments of Don Jose Carmen and the agriculture University in Mexico. Don Jose Carmen is a farmer in mexico that has achieved remarkable results with the use of certain new and ancestral techniques in agriculture. he had succeed to grow cabbages of up to 40 kg, this without pesticides or chemical fertilizers. The biggest agriculture University "Universedad Autonoma Chapingo" of Mexico learned to know him and began to do experiments following his advice. They measured the same results. They were amased because they didn't understand completly how it worked, but they measured it and testify the reality of the possibilitie of these new ways of farming. "Nature's Secret Force of Growth," known and used by the ancients, Paramagnetism has been rediscovered and made known by a "true" natural scientist, Dr. Phillip S. Callahan. I first heard Dr. Callahan talk about these magical rocks and their secret powers at an Acres U.S.A. conference, and soon after, I began collecting and studying volcanic rocks that contain this mysterious force. Paramagnetism is a low-level energy, physical force that has shown to have beneficial effects on all forms of life. Because of our organic farm and compost business, we make and sell all kinds of natural farming, gardening and horticultural supplies. I am constantly searching for, trying, and testing new products. In the past forty years, I have tested many widgets, gadgets, foofoo dusts and snake oils. Some were worth­less, most worked some times, under some conditions, few worked consistently. Paramagnetic rocks and sand have shown more consistent results under more conditions than anything I have ever used, other than compost. Paramagnetic rocks and compost complement each other. They will both work alone, but I have found that each works much better when they are used together. We blend a product using paramagnetic rock and sand, including zeolite collected from four volcanic deposits, plus the addition of a high iron greensand to balance the minerals. We have labeled this blend "Volcanite." It reads 2000+ on the PC meter. Below are some tests comparing Volcanite with controls. TEST #1 - Six cactus plants grown in potting soil; six cactus plants grown in straight Volcanite and six cactus plants in 60% Volcanite and 40% potting soil. By 3 months, the six cactus in the 60/40 mix averaged 50% bigger and healthier than the other 12 plants. The potting soil was 40% compost. TEST #2 - Two plastic trays 20 inches by 26 inches by 6 inches deep were filled with soil contaminated with a hormone herbicide. One tray contained contaminated potting soil; the other contained contaminated potting soil plus Volcanite. Beans were planted in each tray. The merged plants in both trays soon showed evidence of the herbicide. The plants in both struggled along with distorted leaves that were yellowish and they grew very little. They continued in this shape for five weeks. Then the tray that had the Volcanite in the mix started to green up, grow, and was soon blooming and producing beans even though you could still see some herbicide distortion. The tray without the Volcanite never did green up; the plants grew very little and never bloomed. TEST #3 - Four tomato plants were planted in a raised bed containing Volcanite in the soil. Fourteen more tomato plants of the same age and variety were planted nearby in the garden soil containing no Volcanite. All the plants were blooming and setting fruit when a late cold northern hit with a high wind, dropping temperatures well below freezing. All the leafed-out trees, shrubs and other plants were severely damaged. All of the tomato plants were killed, except the four in the soil containing Volcanite. This test is too good to be true. However, I can find no other factor contributing to their survival. Those four plants were completely untouched, as if a freeze had never occurred. You can bet I will be trying to duplicate this experiment! Just think what this could do for the citrus industry if we can learn to give trees 3 to 4 degrees of cold tolerance and at the same time have a natural supply of minerals constantly becoming available that could last for years from just one application of volcanic rock. TEST #4 - Seven one-gallon nursery containers were used. All were filled with potting soil. Two were used as controls. The other five had different rates of Volcanite added. Radishes were planted in each and thinned to six plants per pot. 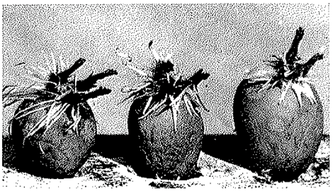 The five pots with the different ratios of Volcanite all grew about the same. The two controls were only about 5% smaller. When all the fruit was about nickel-size, the growth of the two controls stopped and on close inspection, I noticed the underside of the leaves were covered with aphids. All seven pots were in a row with the leaves touching. The two controls were in the middle. None of the five Volcanite plants had aphids or got aphids until weeks later when the plants were old and going down hill. TEST #5 - Four of the plastic trays were filled with potting soil. Volcanite was mixed in trays #1 and #4. All four trays were planted with an equal amount of rye seed. Trays #1 and #2 were watered with electric treated water. (Electric water is supposed to make plants grow better and keep calcium from building up in the soil.) Tray #3 was used as the control. Tray #4 with Volcanite and regular water did the best by doubling the amount of grass growing in the control tray. Tray #1 was second best, but grew only about 30% bigger than the control. The electric water seemed to cancel some of the Volcanite's benefits. Tray #2 was only about 5% better than the control. I have since done many other tests. Never was there a negative result. All tests, in pots or in the garden, always showed better growth, less insect damage, and better color in the leaves and the blooms when Volcanite was used. The plants seemed to withstand stress of all types better. Other people were given some of the Volcanite to try. Among them were a rose grower, retired County ag agent, a PhD, and a commercial native plant grower. All did tests against controls and all reported amazing results. Naturally, I had to have one of the first PC meters that Bob Pike and Dr. Callahan designed. It is my favorite toy, and I am always testing rocks. On a trip to the area of Enchanted Rock, north of San Antonio, I collected chips flaking off the giant granite rocks, some of the decaying granite in the creek beds, and some fresh chips from the very center of giant granite boulders being cut with a diamond saw. The center of the granite boulders measured 325 on the PC meter; the flaking chips from the outer edge measured 144; and the old decaying granite measures 124. This indicates that paramagnetic rocks could lose the magnetism with exposure, but I would assume this loss would be an extremely slow process. Some lava sands register only 180 on the PC meter, but sand that looks identical from different locations registered five to ten times higher. I wonder if they could be a million or so years difference in their ages? Also, why does zeolite, a volcanic ash, read low on the meter? I have tested zeolite from three different locations. The highest tested only 47, with the lowest testing 02 on the PC meter. Fred Walters sent me some volcanic ash he picked up on the roadside that was blown out when Mt. St. Helen erupted. It is similar to some of the zeolites I tested, but the fresh St. Helen ash tested over 2,000. My meter reads to 2,000 and it hit at least that level. It would be interesting to expose this ash to air and annual test to see if it loses power, If it does, how fast? Even though the paramagnetism of volcanic zeolite may be very low, even minus on the meter, it still is very valuable in growing plants. Zeolite has a very high "Cation Exchange Capacity" (CEC). Cations include calcium, sodium, magnesium, potassium, ammonium and other minerals that are necessary to plant growth and health. However, these minerals are not available to plants without a chemical process called "Cation Exchange." Zeolite contributes to this chemical process by giving soil the power to hold base or positive-charged plant nutrients in the soil, especially sandy soils and light potting mixes. When the microbes break down the proteins in organic fertilizers, they release ammonia, aform of nitrogen. Ammonium is a Cation, so is calcium and potassium. All of these nutrients could quickly be lost from soils low in clay and organic matter. Zeolite can hold these nutrients in the warehouse, you might say, until the growing plants need them. I have done numerous tests with volcanic zeolite. Every test I did with zeolite gave good results. I know a researcher who got a grant to study zeolite for two years. He never got any results and gave up. I suspect he was using a chemical form of nitrogen, which was an anion instead of a cation. If a rock can lose its paramagnetism, can it regain it? Out of curiosity I was testing some pieces of brick and broken commode one day and found them both paramagnetic. I didn't know if the clay they were baked from was already paramagnetic. We grind new but broken red clay pipe to make an aggregate that makes a decorative ground cover. The company that makes the pipe is south of San Antonio and in an area where red clay is abundant. The red clay tests 0 to 4 on the PC meter. The pipe baked from the clay reads 75 to 100. At one of our compost locations, we collect old and broken wood pallets to be ground into a mulch. Over 20,000 had accumulated in one pile. Before we had a chance to grind them, they caught on fire during a time when we had 40 -50 mph dry north wind. Needless to say, they all burned up real fast, making an extremely hot fire. The black clay soil down-wind of the fire was burnt to a rock, in fact, it looked like rusty lava rock. This burnt soil tested 329 on the PC meter, while the unburned soil nearby only tested 21. High temperatures must cause paramagnetism. My rich garden soil, however, that has been getting lots of manure, cover crops, and compost reads 138 on the PC meter, while the field nearby that receives less organic material reads only 90. Neither field has ever had paramagnetic rock or sand applied to it. The compost we make reads minus 2 on the PC meter. In his book, Callahan mentioned that oxygen is paramagnetic. On the internet, some researcher reported the earthworms and even microbes can make soil paramagnetic. More reasons for the organic way of growing! At our mill, we make two types of organic fertilizer. The first type contains two formulas made from food and feed-grade proteins that we run through a 1/8 inch pelleting die to granulate it. The other type contains two formulas blended from VIVO (sludge) that was made into hard, small beads or prells using extremely high temperatures. The pelleted fertilizer reads 7 on the PC meter. The fertilizer made from the VIVO with high temperatures reads 40 on the PC meter. At present I am experimenting with upping the PC and mineral value of both formulas with volcanic materials. I have used all ratios of Volcanite mixed into the soil and/or spread on top of the soil. It works either way, but mixed into the root zone, it gives plants extra minerals more quickly. Tests have shown volcanic rock from different locations to contain different minerals. Our Volcanite blend is working well, however, I am constantly seeking to improve it. It may be that different blends may be needed for different parts of the country. Blending could be a whole new science. As far as the best amount to use, I am still not sure. I have learned that more is not always better. Each situation seems to be a little different. In the root zone of the tomatoes in test #3, 1 used about 4 lbs. per plant. When growing in containers, I used 1-3 tablespoons per gallon of soil mix. Maybe more would have done better, or perhaps less would have done just as well. From all of my testing and experimenting, I learned a lot. I learned mostly how much I still don't know. What an exciting future. One thing I am sure of, however, is that volcanic rock and paramagnetism deserve a prominent place in agriculture. Department of Plant Physiology and Pathology, Imperial College of Science and Technology, London.Four years' additional experimental work on the application of a high tension discharge to the growth of field crops is described. Ten experiments with spring-sown oats and barley, two with winter-sown wheat, one with spring-sown wheat, and four with clover-hay have now been described. The discharge was usually given at the rate of 0·5 to 1·0 milliamp. per acre from thin insulated wires stretched above the crop at a height of about 7 ft. and charged to a voltage of 40,000 to 80,000 (crest value). The discharge was usually given for 6 hours a day in two periods, 3 hours in the morning and 3 hours in the afternoon. If the two experiments with spring-sown oats described in previous papers are included and the experiment of 1919 with spring-sown wheat (which yielded only 8 bushels to the acre) is excluded a series of 18 results is available spread over a period of 6 years. Of these 18 field experiments with various crops, 14 gave positive results in favour of the electrified plots, while 4 showed negative results, i.e. decreased yields compared with the controls. Of the 14 positive results only 3 show increases of less than 10 per cent, while 9 show increases of 30 per cent, and over, some reaching 50 per cent, and over. Of the 4 negative none shows a decrease of as much as 10 per cent. Of the 12 experiments with spring-sown cereals 10 were positive and 2 negative. Of the positive results only 2 show increases of less than 10 per cent, while 6 show increases of 30 per cent, to 57 per cent. ; on the other hand both the negative results are quite small, being 6 per cent. and 9 per cent. respectively. The effect of electrification in increasing the yield of spring-grown oats and barley has thus been demonstrated. The mean increase in yield for such crops was 22 per cent. A beneficial effect of the discharge on clover-hay is probable while the effect on winter-sown wheat is still uncertain. Our knowledge of the proper conditions under which the discharge should be given is still so meagre that there is no reason to believe that the increased yields here described are the maximum obtainable as a result of electrification. The mode of action of the current in producing increased growth and yield is still obscure. In several cases the electrified field crops showed a deeper green tint than that of the controls, and work already published has shown that in the case of the coleoptile (plumule sheath) of barley minute electric currents are able to bring about an increase in the rate of growth. The effect of the discharge is of the nature of a stimulus. The additional energy available from the current is too small to have any direct effect since it is only about 1/1000th, or less, of the energy which the plant obtains from sunlight. There is no evidence that gaseous products of the discharge play any part in the stimulation of growth. The additional supply of nitrogen brought to the soil from oxides of nitrogen produced as a result of electrification must be exceedingly small. Footnotes1 The experimental results here described have been incorporated in the reports of the Electro-Culture Committee of the Ministry of Agriculture arid Fisheries, and a brief statement of the results has appeared in the Journal of the Ministry of Agriculture, xxix. 792, 1922. Note: Dr. Albert P. Krueger died on December 8, 1982. Please refer reprint requests or correspondance in care of the Air Ion Laboratory, Department of Biomedical and Environmental Health Sciences, University of California, Berkeley, California 94720.